Goa is one of the smaller states in India and is renowned for beaches,an international tourist spot as we all know however Goa is equally famous for its flavorful food too.When we talk about food,rice with fish curry is the staple diet in Goa. Goan cuisine is famous for its rich variety of fish curry prepared with elaborate recipes.Kerala cuisine & Goan cuisine have a coincidence that both use coconut & coconut oil abundantly in cooking,along with chile peppers,spices and vinegar giving it a unique goan flavor.What a superb blend of flavors,Isn't it?? True friends, its indeed a very delicious curry.It has the richness of coconut and a great fusion of spices & tanginess.Though the ingredients list is long but this can be done in very simple steps and the curry is ready within no time.Enjoy making this at home !! Clean the fish by rubbing sea salt and wash under running water.Drain water,keep aside. Marinate the fish pieces with chilly powder,turmeric powder and salt.Leave for 15 minutes. Heat a pan and dry roast the red dry chillies,coriander seeds and cumin seeds.Powder it in a blender and add the shredded coconut,ginger and garlic along with tamarind pulp.Grind to a smooth paste. Heat oil in a non stick pan and add the marinated fish and shallow fry till its slightly caramelised. Drain on a paper towel. Add in the chilly powder and turmeric powder.Pour the ground masala in it and cook till the oil separates.Add salt,mix well. Add in 2 cups of water and bring to boil.Add in the fish pieces and cook for around 7 minutes or till cooked. When the fish is fully cooked,add the malt vinegar/white vinegar ,garnish with coriander leaves and put off flame. Serve hot with steamed rice !! * I have used king fish in this recipe. * You can skip frying the fish. (Don't deep fry just caramelise the fish for 2-3 minutes either side)This just helps to maintain the shape of the fish and the flavors can seep in nicely. * Increase the spices(green chillies/red dry chillies/chilly powder) if you want the flavors on the more spicier side.This is a in between the mild and moderate version. looks delicious!! !freshly grounded powder...smells gud.. 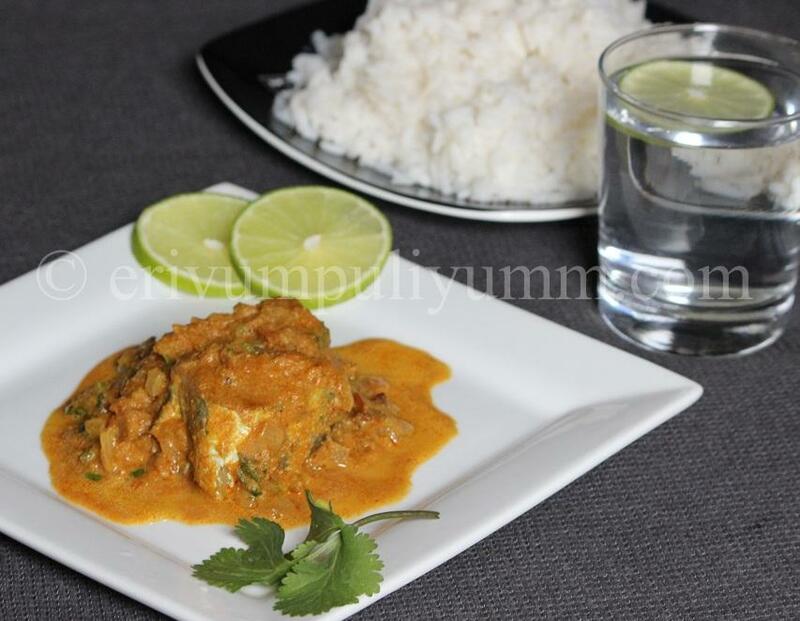 So delicious and flavorful fish curry. Yummilicious! Adipoli meen curry, nalla vella chorum. Flavorful fish with gravy. Nice clicks. 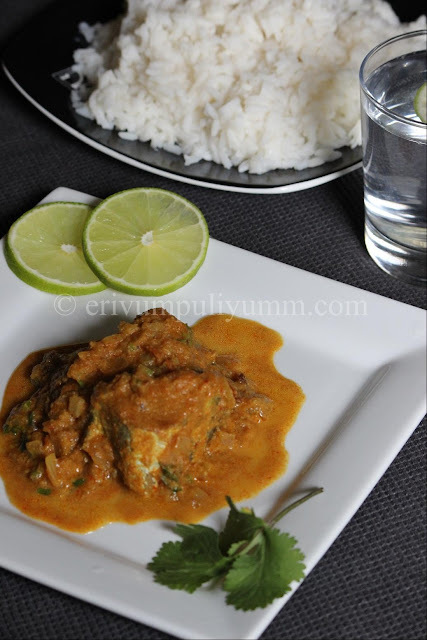 Thanks a lot for posting a wonderful fish curry like this. Would love to visit Goa this year. Wow lovely curry!! Looks so yummilicious!! Nice flavors there :) Delicious clicks too!! Salivating here, wat an irresistible,rich looking delicious dish. I can feel the aroma here :) love the pics. Looks very appealing..I love Indian spices! The entire meal looks so good.. I want to have some right now! This looks super tempting Julie! Nice version of Goan Curry..I love it so dearly Julie..
hi julie, the coriander brings out a delicious flavor too, apart from the spices. i think it is even tastier because you fry/caramelised the fish first. Very healthy and easy recipe to cook at home.